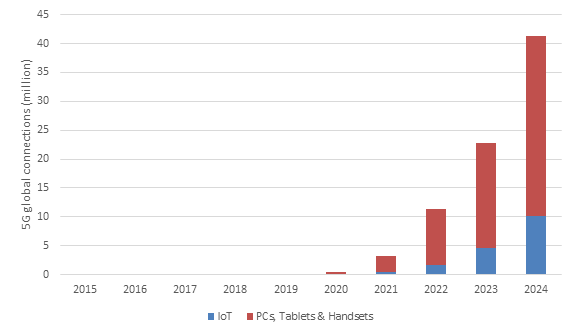 Machina Research today unveiled its first forecast of the likely adoption of 5G within the Internet of Things in the Research Note "5G will account for 10 million cellular IoT connections in 2024". While the lack of certainty about the exact specifications of 5G makes forecasting challenging, Machina Research has taken account of the current state of development to estimate that by 2024 there will be around 10 million IoT connections globally using 5G, amounting to 0.5% of all cellular IoT connections. IoT will account for a quarter of all 5G connections. According to the research, approximately three-quarters of the IoT connections will be in the 'Connected Car' sector, and the vast majority of that will be embedded vehicle connections. Other highlighted applications include CCTV and digital signage. Japan and Korea will lead the charge in 2020-21, with Europe, China and North America following a year or two behind. By 2024 the deployments will still be highly concentrated in those regions. Commenting on the findings, author Matt Hatton said: "5G in the early days is mostly about faster connectivity for PCs, tablets and handsets, rather than IoT. Most IoT applications won't demand the high bandwidth and low latency networks that 5G promises, but there are a few exceptions." Earlier Machina Research reports “5G networks promise to expand MNOs’ capabilities in delivering IoT, but challenges await” (December 2015) and “5G network capabilities will enable MNOs to expand their relevancy across diverse applications” (January 2016) have examined the current status of 5G, the likely technical capabilities and the different applications for which MNOs might seek to use 5G in IoT. Hatton also took the view that the arrival of 5G will have implications for other technologies: "The impending arrival of 5G will also surely make MNOs revisit their approach to 2G and 3G networks. Up until now most operators around the world, most notably in Europe, have been silent on the issue of the sunsetting of 2G or 3G networks. With the impending addition of a fourth air interface, we would expect more MNOs to make the leap and switch off the older generations." In November we published a report on 2G and 3G switch off which concluded that enterprises deploying multi-country solutions couldn't rely on 2G or 3G much past 2020. 5G's arrival helps accelerate that trend.